DecorativeCeilingTile.net’s ugliest ceiling contest winner! In fact, I have no idea how this photographer would muster the mojo to go to work every day in her basement studio before her ceiling remodel. Personally, the unfinished ceiling would have freaked me out. 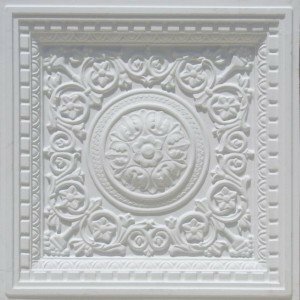 We definitely approve Diana’s choice of tile: VC 02 Faux Tin Drop In Ceiling Tiles in white matte. If you have especially ugly ceiling photos, please send them to us. We will post them for everyone to comment on and to give their ideas of ways to transform your room from ugly to lovely in just few hours! 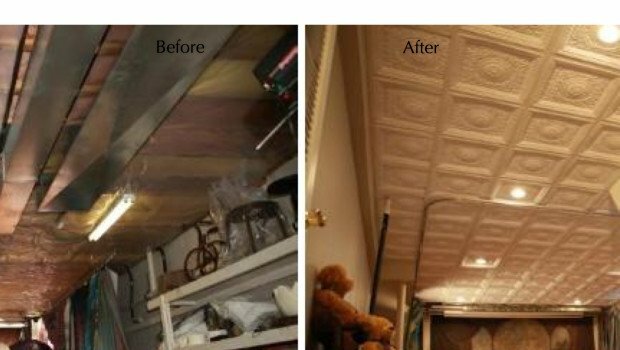 Summary: Check out the before and after photos for this ugliest ceiling contest! Even if your ceiling isn't quite this bad, decorative ceiling tiles can help transform stained, damaged, and ugly popcorn ceiling quickly and affordably.